Some of the IBM software can include multiple multi-gigabyte files, all of which are required for installation. IBM Rational Application Developer is good example. Using the normal windows unzip functionality can make for a bit of a tangled mess of a download directory if you're not careful. I've been working with this software for over a decade and have a pretty simple way to make it go much easier. First, make sure you have Java installed. Open a command line and type java -version. If you get a proper version report, you should be good to go. Otherwise, install a Java JRE, and ensure you have also installed the browser plugin to make the next step go easier. Log into Passport Advantage and locate the software you've purchased. If you can, when downloading, use the Download Director option to make sure all the software is delivered into the same directory, and downloaded as fast as possible. Download Director uses a Java task to open multiple HTTP ports back to IBM to download multiple streams simultaneously. This can mean the difference between downloading at 200Kbps vs. 1200 Kbps. This will print the contents of the directory (mostly zip files) without any other attributes. Now, open the batch file in Notepad or Notepad2. 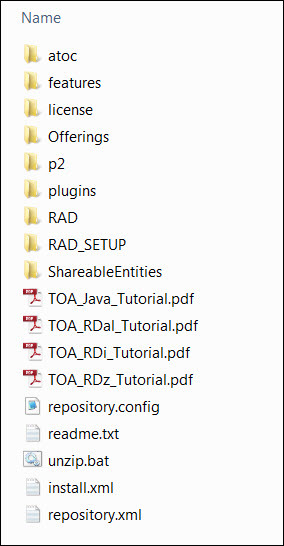 Here is an example where I downloaded the RAD 9.5 beta. Prepend jar -xvf in front of each file name. This calls the java jar command, which is much like a linux/unix tar command. In fact it uses nearly identical parameters (xvf). Once extracted, you can then delete the zips. However, I often archive the zips to a separate drive for further reference if needed. I never archive the extracted files - too much to navigate through and too fat to store.